Total Carat Weight: 1.01 ct. In general, the less color a diamond has the more valuable it is. Natural diamond color scale ranges from D (colorless) to Z (light yellow). Since a diamond's color may be difficult to distinguish when it is viewed face up, gemologists usually evaluate diamonds face down against a pure white surface, illuminated by controlled lighting. The diamond is then compared to master stones of predetermined color. Learn more about a diamond's color. Diamond clarity ratings are determined by the amount of inclusions and blemishes and how visible they are. Inclusions are internal flaws that help make each stone unique. They consist of tiny pinpoints‚ markings‚ and clouding that will affect the overall appearance of the diamond. Blemishes are the external or surface flaws. Flawless diamonds containing no inclusions are extremely rare and very expensive. The majority of commercially sold diamonds contains inclusions that are undetectable to the unaided eye. Learn more about a diamond's clarity. to your diamond jewelry order. Please add 10 business days to the delivery estimate. 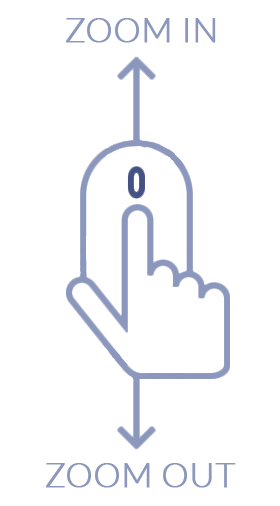 The mission of Anjolee is to provide the highest quality products and customer service. If for any reason you are not completely satisfied with your purchase, you may return any item in its original condition within 30 days of receipt and we will gladly provide a refund, replacement, or an exchange. All customized orders can be returned for full refund within 30 days of receipt. Anjolee offers a lifetime warranty which covers free prong tightening, re-polishing, rhodium plating and cleaning services. In addition to the lifetime warranty, Anjolee provides a one-year warranty on manufacturing defects. The warranty period starts from the day the order is received by the customer and extends to 365 days after that date. It covers the quality of diamonds, metal, total carat weight, gemstones, and craftsmanship. 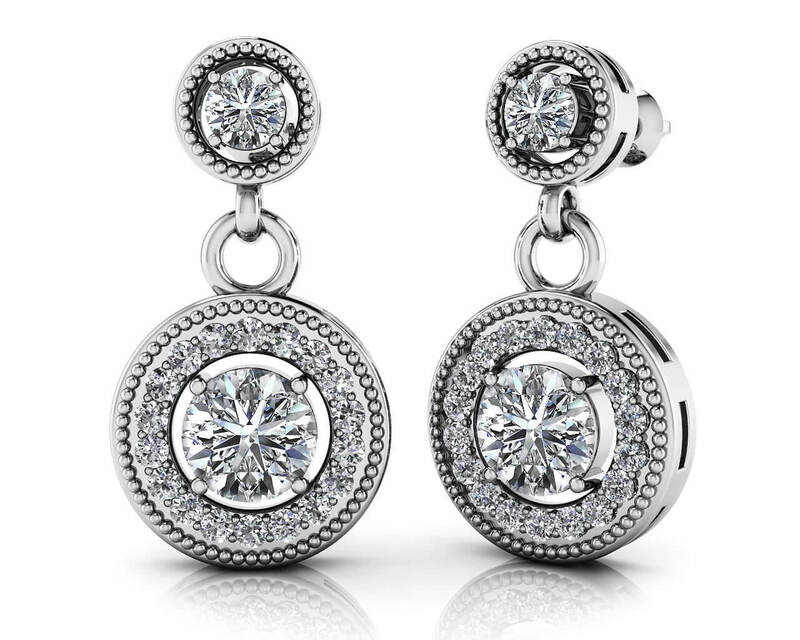 These diamond and gemstone drop earrings are very stylish. 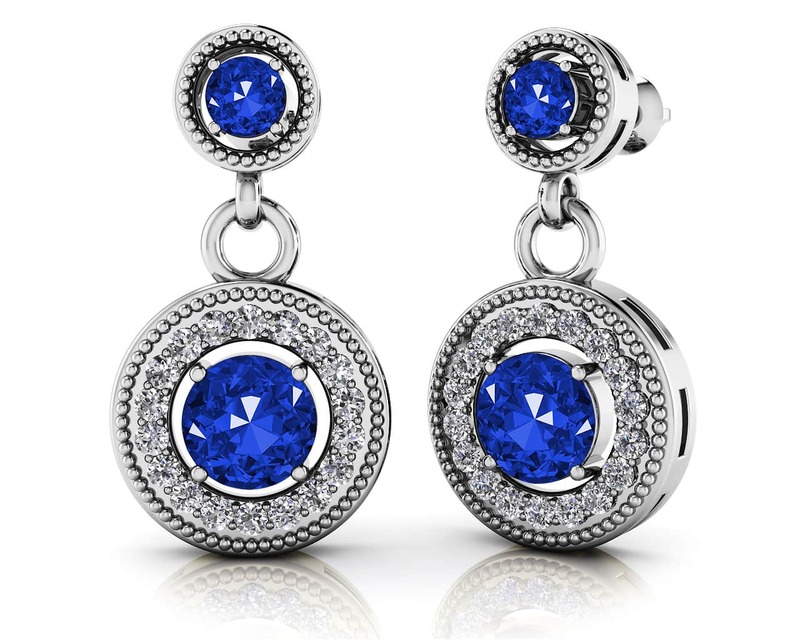 They feature beautiful round, vibrantly colored gemstones surrounded by a fabulous circle of diamonds. They are carefully dangled from another perfect, round, prong-set gemstone at the ear. You can choose from two sizes, either a 1 carat or 2 carat total weight. Customize by ordering these with your favorite color gemstone and watch as these become your favorite pair of drop earrings! Approx. Metal Weight: NaN Gr. Model Carat Weight: 1.01 ct. Effective Carat Weight: 0.30 ct.
Stone Carat Weight: 30X.010 ct., 2X.105 ct., 2X0.250 ct. The charm will be made with the same metal type you selected from the metal type menu. The charm price is non-refundable in the event of a return. Add an exact replica of your diamond engagement ring or diamond bridal set in Sterling Silver and Cubic Zirconium Stones for just $0.00. Having a duplicate engagement ring or bridal set has many benefits. If you are engaged in activities that may result in losing or damaging your expensive diamond ring (gym, swimming, vacationing, etc), the silver replica ring is an easy, low cost solution to ensure your peace of mind! You will receive a replica ring(s) with the same specifications as your diamond jewelry order. The ring(s) style, carat weight, and ring size will be an exact match. Product Information: Sterling Silver is an alloy of silver containing 92.5% by mass of silver and 7.5% by mass of other metals, usually copper. It has a silvery-white color. Cubic Zirconium or (CZ) is the cubic crystalline form of zirconium dioxide (ZrO2). The synthesized material is hard, optically flawless and colorless. Because of its low cost, durability, and close visual likeness to diamond, synthetic cubic zirconia has remained the most economically important competitor for diamonds since commercial production began in 1976. Please note the replica ring can only be purchased as an add-on to your diamond ring order. This item cannot be sold separately. Silver and CZ replicas are eligible for the 30-day return policy. If you have any questions about ordering a replica ring, please contact Service@Anjolee.com or call us at our toll free number (877) 265-6533. The engraving fee is non-refundable in the event of a return. Anjolee issues a free Certificate of Authenticity for each diamond jewelry order. If you require a third-party certificate, you have the option of purchasing one from the International Gemological Institute (IGI). To add a certificate to any order, simply click the checkbox on the product configuration under the diamond quality section. Anjolee will send the jewelry item to the IGI on your behalf and have the jewelry item appraised and certified. Adding a third party appraisal typically adds 5 business days to the estimated delivery date shown on our website. Once the IGI has completed the jewelry inspection and printed the appraisal, Anjolee will notify you via email that your package has been shipped. All certified orders include the jewelry, IGI certificate, and standard documents issued by Anjolee. International Gemological Information, a division of IGI was established in New York in 1981, as a source for unbiased appraisals of gems and jewelry. IGI is totally independent of all commercial sales organizations and does not trade in diamonds or precious stones. Thus, IGI is able to provide independent, accurate appraisals and identification reports. IGI’s Certificate provides a description of the gem of article of jewelry - its identification, weight, measurements, shape, cut, finish, proportions, clarity, color, and when appropriate, the quantity of precious stones. Also included are the identification, content and weight of precious metals. To further identify the item, an enlarged color photograph showing the details – and in the case of diamonds, a diagram indicating inclusions if any – is also provided (.95 ct. and above). Consumers, retailers, jewelers, insurance companies, public accountants, financial planners, commercial banks and estate executors are assured of the most reliable and accurate gemological appraisal reports available today, thanks to IGI’s advanced technology and superior expertise in the field of gems and jewelry. After you receive your IGI appraisal report with your jewelry item, you can verify it online. Click here to verify your report. The IGI also offers updated appraisal reports. To obtain an update on your original IGI appraisal, simply visit http://www.igionline.com . Click on Online Services and then Report Update to fill out an ’online report request’. The cost is $25.00. The S.O.A. will summarize pertinent gemological factors with regard to an article of jewelry. Each article of jewelry is independently examined by experience graduate gemologists working in unison with certified, accredited gem and jewelry appraisers. These gemological factors include the authenticity and weight of the precious metals, identification and the quality of diamonds and gemstones. A color photo of the article of jewelry is also indicated with each summation. IGI’s seal of inspection will be attached to each article of jewelry appraised and upon request the unique S.O.A. report number and IGI logo will be engraved into the shank of the ring for identification purposes. IGI’s Summation of Appraisal is available in several formats. The computer generated micro-cert format fits perfectly into IGI’s new Appraisal Summary. This credit card format is available in a passport holder or an IGI box as well. Anjolee issues a free Certificate of Authenticity for each diamond jewelry order. Anjolee allows you to add to your order and purchase a third party certificate from the International Gemological Institute (IGI). Purchasing a third party IGI jewelry certificate is an optional feature. The exact cost of the certificate is shown while customizing each product, on the shopping cart, and on your invoice. Note that Anjolee does not refund the cost of the certificate in case of a return. Send an email to someone you know about this item. Shopping for loved ones can be challenging since there are so many options. As a helpful hint, really loves the Four Prong Classic Tennis Bracelet.